Without a STEM, a Flower Can't Grow: A look at how SAC is growing in the areas of science, technology, engineering and math. Dan Suttin is a math tutor with the Developmental Math Lab at San Antonio College. He also enjoys the art of making Geometric Models. First and foremost, I would like to say that I have found the level of course work in the Math Department here at San Antonio College to be excellent, and the quality of teaching as well. My favorite course –as a student—was College Algebra. Although I had taken a similar course many years ago, I found that 95% of the material was quite new to me, and I absorbed it like a sponge. Since working as a tutor in the lab, it seems like I have been taking the course over and over again for almost three years, and I’m learning the material more and more deeply as I go. There are three different College Algebra courses to choose from here at SAC, depending upon one’s career objective and degree plan. Students use three different text books, as well as a computerized, online course to aid learning. There are many different professors teaching the course, and each professor has his or her own preference as to which topics within the curriculum should be accentuated. Some professors even have different methods of approaching the same topic. For example, there are different techniques for using row operations to solve systems of equations with matrices or for evaluating 3×3 determinants. Professors use varying techniques for testing to see if the graph of a rational function crosses its horizontal assymptote, and some stress different approaches to working with logarithms and exponentials. It is my job, as a tutor, to understand where the professors are coming from, and to adapt to the teaching methods they are using. The “Big Ball”, created by Dan Suttin, was on exhibit in the Oppenheimer Center (formerly called the AIC) from January 2010 through March 2011. In addition to being a “math guy”, I am also interested in 3-D Geometric models and constructions as an art form. If you stepped foot in the Oppenheimer Center (formerly called the AIC) anytime from January 2010 through March 2011, you would have seen the “Big Ball” I had on exhibit there. I have since opened another exhibit called the “OCTA-TETRA Museum” located near the intersection of Guadalupe and Frio. Learn more. 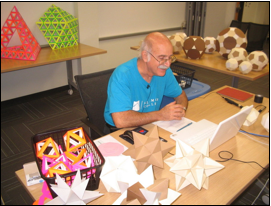 Also, I recently presented a webinar for The American Mathematical Association of Two-Year Colleges (AMATYC) about “OCTA-TETRA Constructions and Polyhedron Models.” Watch now. I can truly say that it has been a pleasure working as a tutor at SAC and sharing my passion for teaching mathematics with students who are so eager to learn. Dan Suttin is a tutor in the Developmental Math Lab (MCCH 121 and 119) at SAC. He assists students with math work in all the courses from Basic Mathematics (Math 0300) all the way through Pre-calculus (Math 2412). After working as a math instructor at the Healy-Murphy Center, an alternantive high school in San Antonio, Dan retired. Upon his retirement, he heard of SAC’s Senior Citizens’ Program where seniors over the age of 65 can audit courses for free. Dan then decided to enroll in College Algebra (Math 1414) and Trigonometry (then Math 1316, but now called Pre-calculus, Math 2412). Along the way, he realized there was a need for math tutors. So, he applied and was hired. He has worked as a tutor at SAC since the early months of 2010 and continues to help countless SAC students succeed in math courses each semseter. This entry was posted in Art, College, Math, San Antonio, Science, STEM, Uncategorized by STEMatSAC. Bookmark the permalink.